This year I will have a 4/5 split - although I will have mostly grade 5 students, I will have a handful of grade 4 students, and the grade 4 curriculum is brand new to me, so I've been doing a lot of curriculum reading this summer. I'm also moving into the classroom next door to mine ... which makes me a little sad, honestly. I was in the same classroom for about 12 years (even through grade level switches) and had put a lot of blood, sweat, tears, and money into making it the perfect little environment for my students and me. The classroom I'm moving into is the exact same odd little trapezoid shape, but it is completely bare, and doesn't have a smartboard (sniff, sniff). I'm excited to start decorating again (and my living room is FULL of goodies I've begged, borrowed, and bought to make my space), but I am going to miss my smartboard ... big time. I can't wait to show you the pictures once I start the set-up process (but since I don't actually start until September - you'll have to wait). One of the main questions I get from my blog and facebook followers around this time of year is "Of the resources you've created, which ones are your favorites or must-haves in your classroom?" 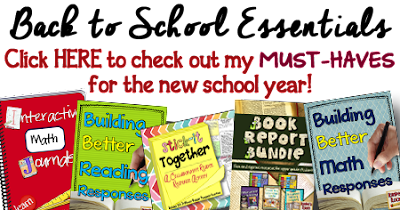 You can click on the image above to see all of my Back-to-School Essentials - resources that will take you through the entire year in your classroom, and are the backbone of my teaching - all student tested and loved. Interactive Math Journal - we do one entry every week - and I wouldn't trade that time for anything in the world. My students love the entries and I love how self-sufficient they become as learners as they have created their very own reference guides. Stick-It-Together Math Responses - perfect for small groups and peer work when learning new concepts. LOVE the collaboration that happens with this resource. Reading Comprehension Posters - I love having a variety of posters I can use to pull from to use as formative or summative assessment activities and informational reading in the content areas, plus, they make a great bulletin board display of learning and portfolio piece. They are also a perfect sub day activity. 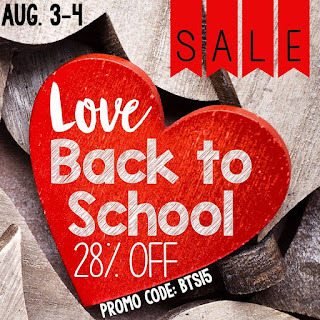 The BIG Back-to-School TeachersPayTeachers sale is happening this Monday - Tuesday (August 3rd - August 4th) to help you gather some resources you'll need for back to school. For two full days, all my resources will be on sale for 20% off, and if you use the code BTS15, you'll receive an additional 10% off at the check-out (don't forget to use the code - I'm telling you this from personal experience - lol). I'm filling my wishlist with grade 4 materials right now!!! Would you mind sharing about how you plan to cover all the standards for two grade levels, particularly in math? We also have a 4/5 combo class this year and are really struggling on how to schedule the day. THANK YOU!! Such great ideas! Were you considering making a grade 4 interactive science notebook this year?